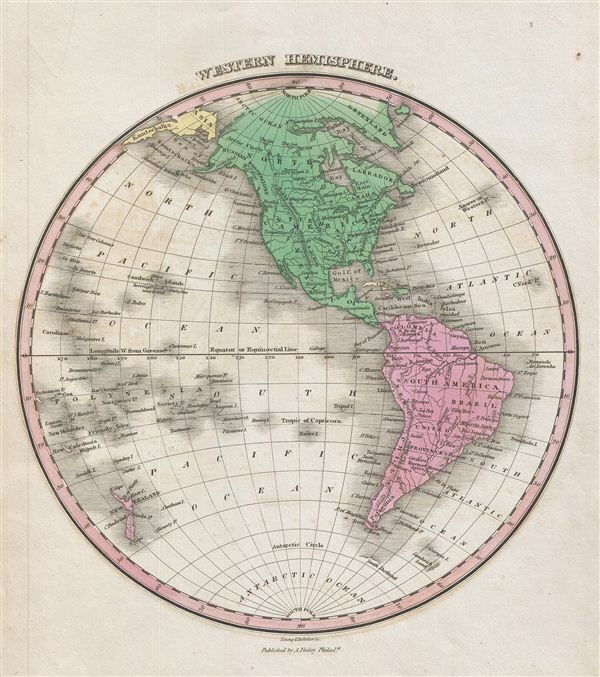 This is Finley's desirable 1827 map of the Western Hemisphere. Includes North America, South America and most of Polynesia. Identifies rivers, mountain rangers, lakes, and major cities. Color coded according to continent. Includes New Zealand and parts of Siberia. Engraved by Young and Delleker for the 1827 edition of Anthony Finley's General Atlas. Very good. Some minor discoloration in lower left quadrant, near Falklands. Erased pencil marks to margins. Rumsey 0285.001 (1831 edition). Phillips (Atlases) 4314, 760, 752, 6045.